There is no doubt that the US is home to many fabulous art museums. You can spend hours upon hours gazing at the collections. Art museums offer so much in the way of history and culture and when you combine those lessons with an opportunity to enjoy the outdoors, it makes the experience even better. Did you know there are plenty of places you can enjoy artworks outdoors? TrailBlazer Magazine takes a look at some major outdoor art installations as well as sculpture parks and gardens across the country. Some are associated with art museums and require an admission fee but others are just there – available for public consumption (and admiration) at no cost! 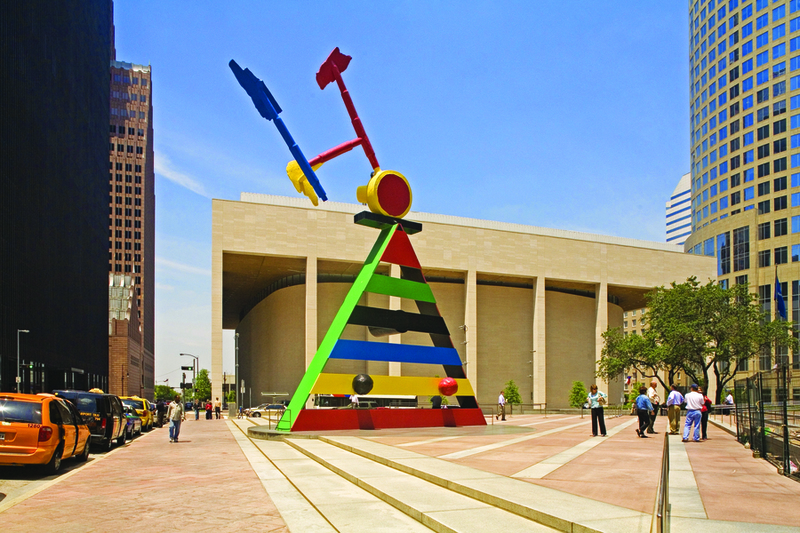 The outdoor Sculpture Garden has 21 works of art including a giant typewriter eraser by Claes Oldenburg and Coosje van Bruggen, a giant bronze spider by Louise Bourgeois, Robert Indiana’s AMOR pop art letters and Alexander Calder’s sheet metal horses, Cheval Rouge. The exhibitions are set among native American plantings with flowering trees and shrubs and a variety of perennials. The centerpiece is the garden’s fountain which in winter weather is transformed into a skating rink. Summer Sculpture Garden hours are 10 a.m. to 7 p.m., except Sundays when it opens at 11 a.m. On Fridays, weather permitting, the Garden stays open until 9 p.m. and hosts Jazz in the Garden. Best of all, this beautiful outdoor museum is free of charge. For additional information visit nga.gov/visit/sculpture-garden. 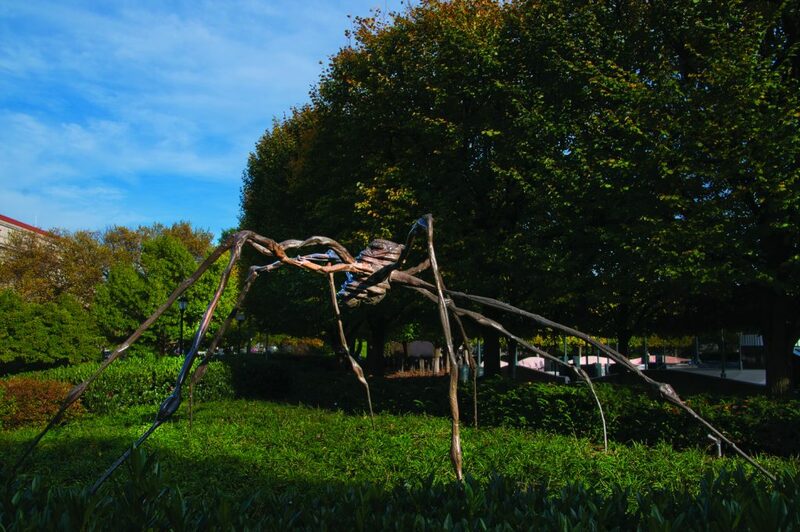 Louise Bourgeois, Spider, 1996, cast 1997, National Gallery of Art, Washington, Gift of The Morris and Gwendolyn Cafritz Foundation. Photo courtesy of National Gallery of Art. Another opportunity to experience the arts free of charge sits on 9 acres of land and houses both permanent and visiting installations. Works include Alexander Calder’s Eagle, and Eye Benches and Father and Son by Louise Bourgeois. 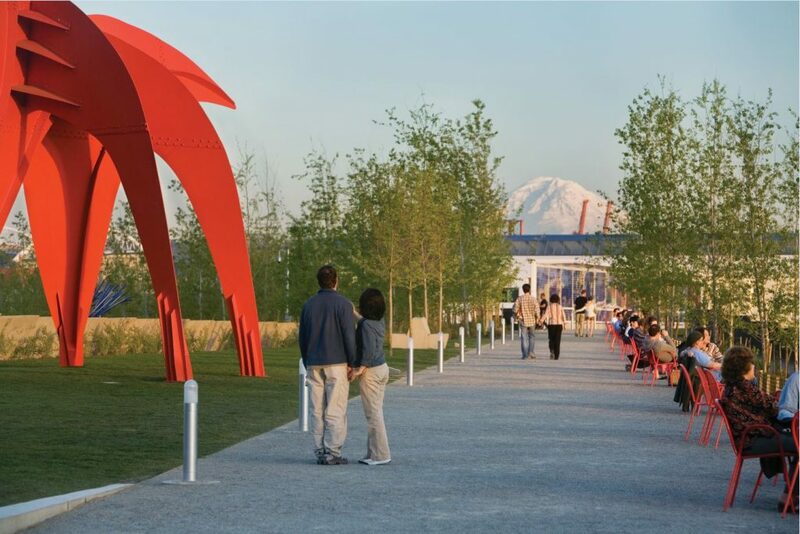 The Sculpture Park is adjacent to Myrtle Edwards Park and on the waterfront which offers beautiful views of Puget Sound and the Olympic Mountains. The Park is open year-round and admission is free. The Sculpture Park opens 30 minutes before sunrise and closes 30 minutes after sunset. For information visit seattleartmuseum.org. Olympic Sculpture Park. Photo courtesy of Seattle Art Museum. Photo by Benjamin Benschneider. Located in a suburb of St. Louis, Laumeier is one of the first and largest sculpture parks in the US. What is neat about this sculpture park is that it can be viewed by hiking along your choice of three separate trails that are each less than a mile in length. There is the paved Central Pathway (.64 mile loop); the Art Hike Trail at .77 miles, and the Western Woodland Trail, a short ten-minute hike at .15 miles. Guided tours are also available. Free to the public and open year-round, artworks include, Mix, a giant cement mixer by Brazilian artist Alexandre da Cunha; the whimsical, Heritage Schooner for Debra Lakin, by American artist George Greenamyer; and Dave Derington’s, Virtual Laumeier, an ode to modern gaming. For more information on Laumeier visit laumeiersculpturepark.org. George Greenamyer, Heritage Schooner for Debra Lakin, September 30, 1998. Photo by Jamie Vishwanat. Another collaboration of Claes Oldenburg and Coosje van Bruggen can be found in Rincon Park along San Francisco’s Embarcadero. 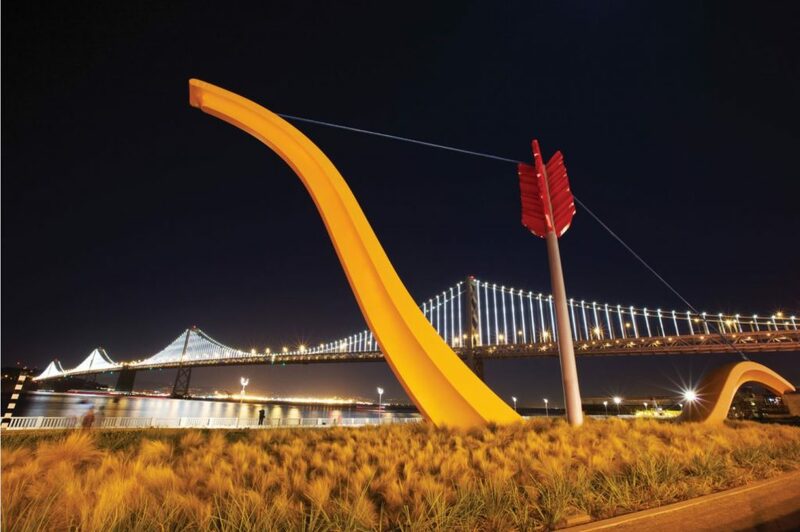 The artists, who are married to each other, said Cupid’s Span was inspired because San Francisco is said to be the home port of Eros, the Greek god of love. Cupid’s Span at Embarcadero. Photo courtesy of San Francisco Travel Association. Photo by © 2013 Scott Chernis Photography. If you take a drive to the desert, about 30 miles outside of the Las Vegas Strip, you’ll find a different kind of mountain range in the form of Seven Magic Mountains, an art installation by Swiss artist Ugo Rondinone. Rondinone’s magic mountains are seven colorful stacks of boulders towering 30 feet above the desert landscape. The colorful towers were created by Rondinone as a “creative expression of human presence in the desert.” Originally installed in May 2016, the plan was to leave them up for two years, but at present, they will remain through 2018. 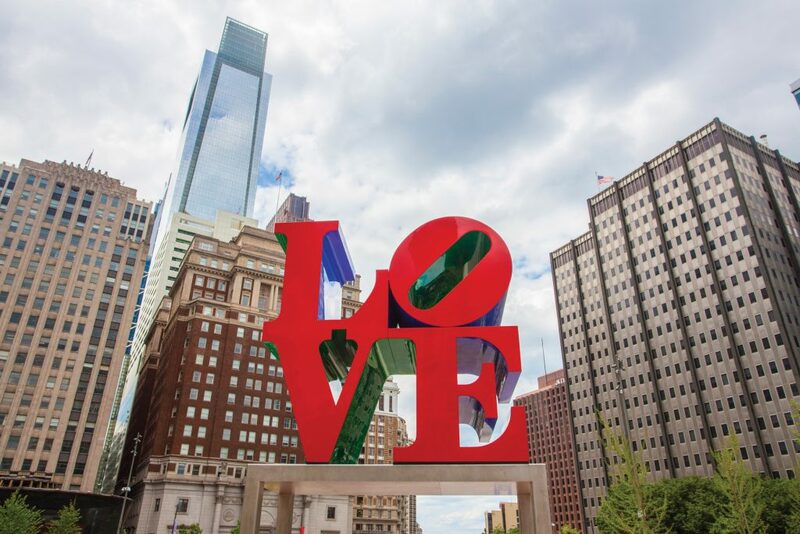 What is a more apt art installation in the City of Brotherly Love than that of Robert Indiana’s iconic LOVE sculpture? Originally installed for America’s Bicentennial in 1976, it was so “loved” that it was reinstalled permanently in 1978 for a brief time since it made its home in New York, but thanks to the generosity of a local businessman who purchased the sign and donated it to the city, LOVE is forever in Philly. Visit the John F. Kennedy Plaza at 15th Street and John F. Kennedy Boulevard to feel the LOVE. Robert Indiana, LOVE. Photo by C. Smyth for VISIT PHILADELPHIA®. The largest piece ever commissioned by Spanish art and sculptor, Joan Miro, can be found in Houston at the JP Morgan Chase Tower (also Houston’s tallest building). 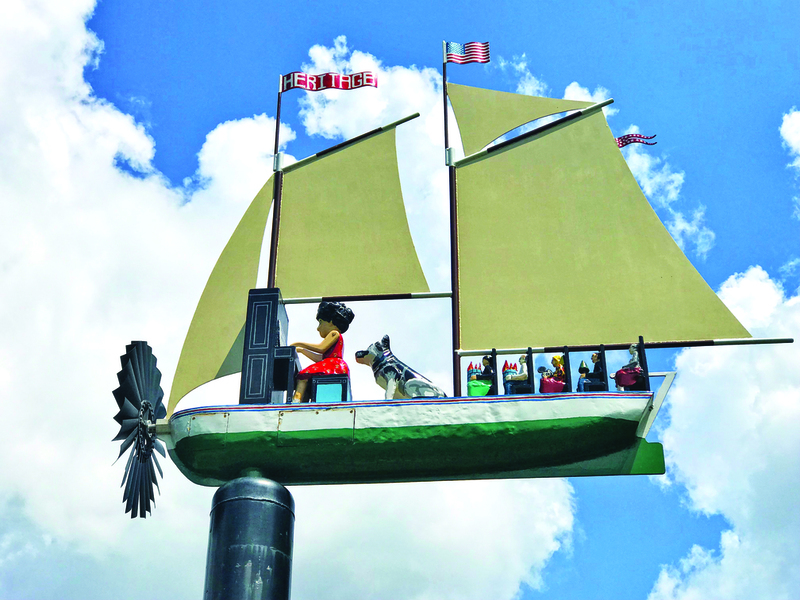 Soaring five stories high, Personage and Birds, a brightly painted bronze and stainless steel abstract apparently depict a woman and three birds. But it may also be a stick figure of a man with artist’s pallets. And similar to his contemporary Picasso, Miro didn’t title the piece leaving people to question what it may be. Check it out at 600 Travis Street in Houston and see what you think. Personage and Birds, by Joan Miro, outside the JPMorgan Chase building in downtown Houston. Photo courtesy of Visit Houston. Well, beauty may be in the eye of the beholder but there is plenty to see in these outdoor exhibits and whether you see a horse or a woman with three heads in a particular piece, it’s all about seeing things differently than someone else and being OK with that. As Thomas Merton says “Art enables us to find ourselves and lose ourselves at the same time.” Now go get lost and find yourself in outdoor art! There’s much more to explore in TrailBlazer Magazine… be sure to check out the August 2018 issue today!